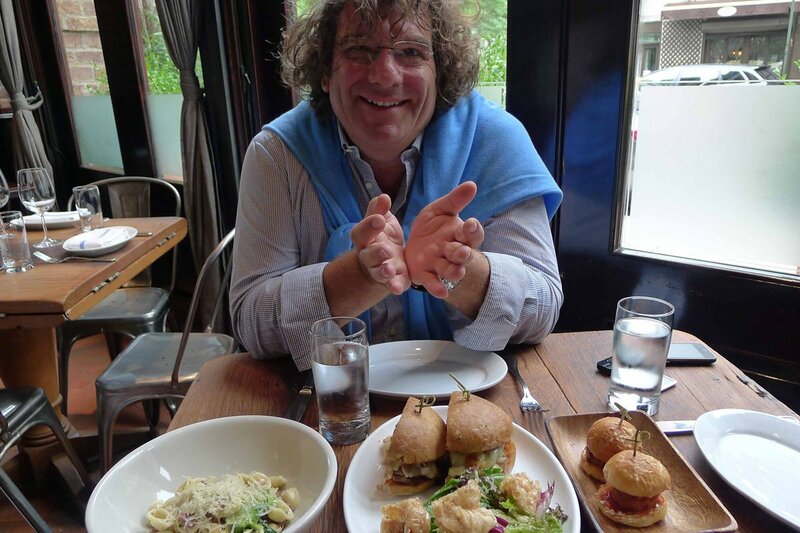 Chef Fulvio Pierangelini getting ready to dig in at Locanda Verde. Photo by Pavia Rosati. The mission was simple: guide a superstar Italian chef, who has never set foot in the United States, on a lightning lunch tour of Manhattan's best Italian restaurants to see what he thinks of American's version of Italian food. The superstar is Fulvio Pierangelini, executive chef of , which include in Rome (see our ), in Florence, in London, in Sicily, and in Berlin. Pierangelini, however, is better known in food circles as the mastermind behind Gambero Rosso, an intimate establishment on the Tuscan coast where he cooked every meal and answered every phone call with obsessive care and attention. When it closed in 2009, it was considered Italy's best restaurant. Ours was an absurd challenge, sure. But tell that to everyone who has tried to see Venice in a day. The chefs we called were totally game for the game: Prepare your single, best, most representative dish — the one that really wows — for an Italian colleague who wants to see what Italian food in tastes like in New York City. The all-star cast included Andrew Carmellini at , Mark Ladner at , Nicholas Anderer at , and Michael White at . Also invited, but unavailable to play, were Scott Conant from and Mario Carbone and Rich Torrisi of . To keep it a somewhat level playing field, we did not include any chefs who are real Italians from Italy, like Matteo Bergamini from . We begin at , because that's where I meet Pierangelini, who is there with his son and three sous chefs, shopping for a dinner he was cooking that night. Nicola Farinetti, Eataly's general manager and partner, suggests we try pizza verace. The Italian waiters and pizzaioli come over to catch a glimpse of Pierangelini. The pizza is a margherita: basil, mozzarella, tomato, crisp crust. "Last year, I was asked to create a red, green, and white pizza, the colors of the Italian flag, for a national soccer event," Pierangelini tells me. "The white was ricotta, the green was zucchini with mint, the red was shrimp." We're speaking Italian, and he digs in. "First of all, you should eat pizza with your hands," he says. I put down my knife and fork. "This is a good pizza," he says. "It respects the history and makes zero concessions, so I like it." Then follows the first culinary lesson of the day, a quick treatise on the three styles of Italian pizza: Neapolitan (soft dough, thin crust, cooked in wood-burning oven, must be eaten hot), Roman (crunchier, flatter, "the pizza of my childhood"), and modern (made by machine, "which I don't like. Pizza dough must be pulled by hand"). Eataly is about to open its next outpost in Rome. Pierangelini, who lives in Rome, was asked to collaborate on the project but didn't, so I was curious what he thought of the New York venue. I'd done my research on this guy and got the scoop on him from some Italian chef friends, and I knew that he wouldn't mince words or opinions. "I really like it. At first, it seems like an old place, but then you realize that it's beautiful because this is an Italy that doesn't really exist anymore." In the cab, I ask Pierangelini why he's never been to New York. "For 32 years, I was afraid to fly. I went everywhere by car and by train. I lost so many opportunities. Especially in the '90s: in Tokyo, Singapore, Hong Kong. I used to dream about being in New York, but then I'd wake up and had to come home, so my dream became a nightmare. In fact, I researched coming to New York on a cargo ship. I would have loved the solitude: My melancholy increases, and I like it like that." I point out the High Line; I tell him about the Italian grocery store Buon Italia in Chelsea Market. He continues his story. "It's been three years that I've been flying, and I've already taken 500 flights." How did he overcome his fear of flying? "One day, I just did it." I had heard that this guy was formidable and fierce. He is. Once seated at Locanda, he immediately comments on the room. "E' bellissimo." It's beautiful. Of the orechiette, he says: "This is a Norcia-style dish with sausage. The chick peas and the vegetables are a newer twist, but the base is traditional." Of the slider: "It's very cute. This is part of our history, but it's also very original." Of the porchetta: "This is delicious. I don't know how it is here, but in Italy, porchetta has two very important parts: the meat and the skin. And Carmellini is doing the skin in such a fun way. And finally! A properly cooked onion." We note that the restaurant is attached to the Greenwich Hotel, which leads to a discussion about working in hotels and specifically, room service. "I found myself battling things like the club sandwich. It's uneatable, especially for women. It's too big. I made a compact club sandwich, of dimensions that could be eaten, concentrating all the flavors. And the reaction I got from customers was, 'this isn't a club sandwich.'" As we're walking in, chef says, "I know Lidia Bastianich. Is she still cooking at Felidia?" He surveys the room — "Now this is an elegant restaurant" — and marvels at the scale. "Four hundred seats. I had 24, and I thought that was tough." Mark Ladner comes out to welcome us. "Chef, you're a legend," he says in his typically sweet and modest way. He returns to the kitchen and emerges carrying a silver platter with a 100-layer lasagna alla piastra — ragu, bechamel, and pasta. It's a show-stopper, and everyone grabs their cameras. "This is extreme attention to detail," Pierangelini declares. We are served a larger-than-usual portion, which has been grilled on one side because, according to Ladner, "everyone wants the corner piece." Pierangelini asks for a menu. "There's an almost maniacal attention to detail here — every dish has its own special olive oil. They sought the best Italian products available. May I have a look at the kitchen after?" Ladner returns to the table and we discuss the lasagna. The conversation turns to how Americans have a preconceived notion of what Italian food should be, which can be challenging for chefs. "It's much harder for Italian chefs from Italy to make Italian food in New York," Ladner says. "The sensibility is completely different." "Americans are accustomed to a lasagna their grandmothers made with dried pasta," I say. "Which is barely Italian," Ladner adds. "It's the same in Italy. On the same floor of a building, if you have three families, you have three different lasagnas. But as long as you cook with respect, that is what is important." says Pierangelini. "And this lasagna is lovely." Ladner gives us a tour of the upstairs and downstairs kitchens. Pierangelini stops and spends time watching the women making homemade pastas. The cryogenically frozen tuna in the supersonic freezer inspires a chefly chat about the challenges of serving fish and a bonding over their favorite Sicilian fish market, where, according to Pierangelini, the tuna is ranked for dispatch: "For Tokyo, for New York, and, feh, for the rest for Italy." In the taxi to the next stop, Pierangelini says of Ladner, "He's a good cook and a talented guy. That's a beautiful, marvelous restaurant." "Someone who really understands spaces designed this room," Pierangelini says as we tour the restaurant. He settles into his seat in the bar area and looks out at Gramercy Park. "I could stay here all day." Danny Meyer walks by on his way out and I make introductions. Meyer, in flawless Italian, says, "Gambero Rosso! The best restaurant in Italy!" Chef Nicholas Anderer comes out to say hello, and the subject immediately turns to Rome. "Did you study there?" Pierangelini asks. "Yes, but I studied art history," Anderer says. "Though I just ate a lot in Rome." And the topic turns to their favorite Roman restaurant: . Ever mindful of the tight schedule we're on, I tell Anderer that I'm so sorry, but we're in a terrible hurry, and Pierangelini says to me, "Never tell a chef you're in a hurry! If you don't have time to eat properly, get out of the restaurant." Okay then. I've been scolded and schooled. Anderer returns with two pastas, one classic and one Maialino-style. The classic is a cacio e pepe; the modern is malfatti with pork. Piergangelini nods his approval. We dig in, and the table is very quiet for a while. "This is really classic," he says of the cacio e pepe. And we all comment on the lemon note in the malfatti. "You can tell that there's great technique and passion," chef notes. Anderer returns. "What's the verdict? Ti piace?" he asks Pierangelini. Do you like it? "I stole the cacio and pepe from Felice," Anderer says. "Felice in Testaccio," the chefs answer in unison. Another favorite restaurant they have in common in Rome. As in, obviously. Pierangelini asks Anderer if he does the room service program at the hotel, and I bring up the club sandwich issue. "What I hate about club sandwiches in New York is that they serve the mayo on the side," says Anderer. "So you have, what? Eight different pieces of bread that you have to slather mayonnaise onto." En route I point out Grand Central, and I tell him about the Union Square Greenmarket. I point out his hotel when we pass by "to give you a sense of where you are." "I like to get lost," he says. Ai Fiori chef and owner Michael White is traveling, so we are greeted by executive chef Chris Jaeckle, who explains the dish in so much detail I'm starving. "Did you work in Italy?" Pierangelini asks. "Never. I'm from Long Island. I work for Michael," Jaeckle answers. "Yes, this is very much a San Domenico dish," Pierangelini notes, referring to another epic Italian restaurant where White had worked. How does he feel about Italian chefs who have never been to Italy? "This chef has studied with Michael, who spent a lot of time with one of Italy's greatest chefs. This is a beautiful dish, and you can taste Italian culinary history in this. The first Italian chefs who went to France to study 30 years ago...we all went...this dish reminds me of mixing of France and Italy. It's very fun, and I can make these observations because I lived this history. This is clearly a successful dish. It's not an accident that they've served it to us," he smiles. "And it is executed perfectly." He explains how the sauce was prepared, and I instantly want to go to a kitchen to try it out. "If you want to learn French cooking, you go to Paris, and in a year or two you've learned perfect French technique. But Italian cooking, you can never learn, because it has to be in your DNA. You can learn the recipes, but you can't learn what our mothers and aunts and grandmothers have — that feeling, that naturalness. You can reproduce Italian cuisine, but it's extremely rare that you can interpret its soul. Paradoxically, Italian cuisine is the only cuisine that's unrepeatable." Does that mean that the American chefs we met today can't ever expect to cook real Italian food? "No, not at all! The Italian food I have eaten today is better than much of what we eat in Italy."